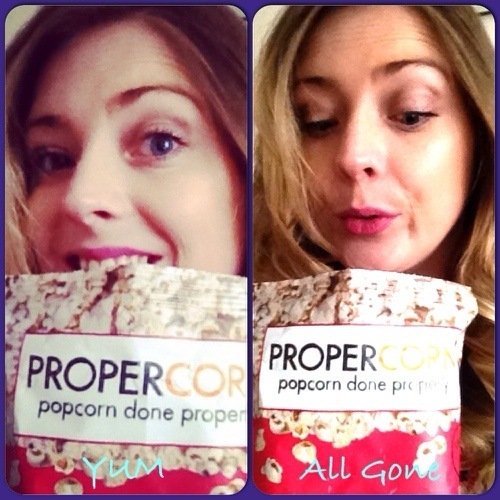 Today is officially Popcorn Lovers Day! Any excuse to get my mitts on some more sweet and salted topcorn Or my more recent favourite Fiery Worcester sauce and sun dried tomato propercorn YUM. Popcorn brings me nicely on to my rant for the week. Picture the moment: a night at the cinema, popcorn on lap, comfy in seat, movie just starting, a hush starts to fall and the person beside me decideds this is the perfect moment to wap out the noisy crinkly packet of crisps she smuggled in. My teeth are gritted my back is up and in my head the words Jesus Christ are going round and around. The movie has started and I have missed the opening scene because I’m busy trying to bite my tonge while the person next to me is crunching down into a noisy crisp packet and stinking and I do mean stinking of smokey bacon! Luckily it wasn’t a multi pack otherwise it would have ended with the crisps in the air and the entertainment being off the screen. Noisy eaters or things that make a noise in places that are quiet and peaceful really get my goat. I can handle the noise of quietly munching nachos – it is more the noise that the packaging of crisps and sweets make. Probabbly very silly in the grand scale of things. Maybe if the cinema dropped their snack prices a bit then I could enjoy my film in peace. Is there anything ridiculous that rubs you up the wrong way?